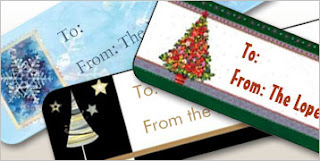 Centsible Savings: More great holiday stationary deals - FREE labels and more! 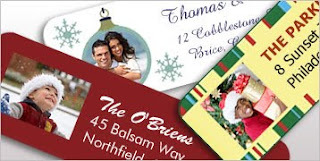 More great holiday stationary deals - FREE labels and more! 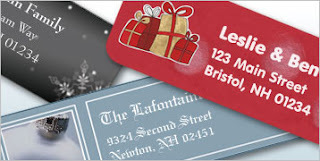 This holiday season, dress up your gifts and save time with these handy, self-sticking labels. 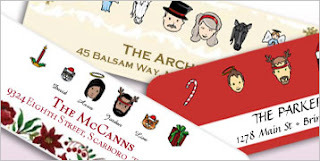 Return address labels personalized with your own personalized caricature! These were really fun to create. I did some for our family and you can customize everthing from haircolor to face shape and add hats, jewelry, etc. Have fun making yours! Self-sticking labels are useful for letters and packages, or to label books and other items. Hundreds of full-color designs. Go here, under Home and Family on the left side click on Holiday, then Labels. You can get all of these for FREE in one order. If you were to just order one shipment of 140 labels your shipping will be under $3.00. Adding more items will increase your shipping but will be a better deal than ordering them all separately.